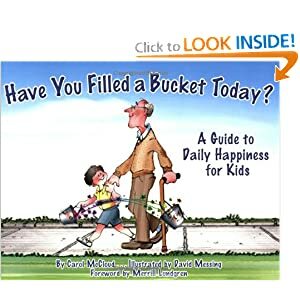 Yesterday in third grade we read the book Have You Filled a Bucket Today? It’s subtitled “A Guide to Daily Happiness for Kids.” Though the illustrations and phrasing in the book are targeted towards kids, so much inside of it is really a guide to daily happiness for people of all ages,. The premise of the book is that everyone walks around carrying an invisible bucket (representing happiness, self-worth, and confidence). We can fill the buckets of others in big and small ways – increasing fullness. We can dip into the buckets of others – increasing emptiness. The only way we can contribute to our own buckets is by filling up others’. We spend a lot of time together in the classroom. When we arrive at school each day we enter the building feeling varying degrees of light and heavy emotions. We communicate those with words, actions, facial expressions, and tone of voice. Some days we know why we feel a certain way, and some days we just can’t seem to get a handle on the cause. Sometimes the ways we act as “bucket dippers” aren’t as obvious as physical hurt or overtly mean language. Sometimes it’s a mean look with our eyes which is loaded with meaning. Sometimes it’s an edginess in our tone of voice. Sometimes it’s avoiding or ignoring someone. More often than not, people who dip into your bucket are carrying around an empty bucket of their own. Ways that we can be “bucket fillers” can be big (working on paying attention to adjusting something in our character that makes us better able to fill others up) or can be small and specific (saying hi to people using their name more often). After we read we all took a small note card and wrote down two things we wanted to do to fill buckets. We folded the card, wrote our names on the outside, and stapled them shut. We sealed them in an envelope to revisit in a week or two. While I am absolutely ITCHING to take a peek at what they wrote, I recognize that there was something very meaningful about them putting their secret hearts down on paper, and want to honor that. This concept extends beyond a morning read aloud intended to connect a classroom community together. As we look around at people around us: the impatient driver, the terse cashier, the stranger who provides a small kindness, the distracted person lost in their thoughts, the anxious parent….we are each deeply involved in our own experience, no matter our age. The buckets of children are no smaller than ours, and the fullness or emptiness they experience is no less real or powerful to their minds and hearts. They may not have the language to express it yet, or the experience to process it. However, as educators we can provide opportunities to learn the act of filling, to recognize the act of emptying and resolve it, and to value the importance of pursuing communities that are aware of how deeply emotional and connected the human experience is. This entry was posted in Character, Education by cmschilly. Bookmark the permalink.